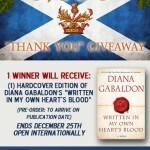 Outlander Addiction » Outlandish GIVEAWAY! To celebrate (almost) 1200 ‘likes’, AND the announcement of a few of our favorite characters casting for the Starz television series (we love you Sam and Tobias! ), we are having another giveaway! 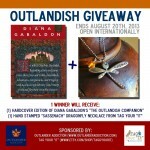 The prize is (1) Hardcover copy of Diana Gabaldon’s “The Outlandish Companion” AND (1) hand-stamped “Sassenach” dragonfly necklace, donated by Tag Your “It” jewelry store. Giveaway begins now and will run thru August 20th, 2013. Giveaway is open internationally. Void where prohibited. Must be over 18 to enter. I just love Outlander. Have since it was released originally, can’t wait for the next book and the show! Thanks for the giveaway! All the excitement about the series is welcome! I cannot wait to see what is coming for all of us fans! I love Diana Gabaldon’s Outlander series. I’ve read them all several times, just waiting for the next one!! One of the best series ever written! Love Outlander series!! Cannot wait for the 8th book and the series on Starz!!! Woot!! I’m just going to say “Je Suis Prest” for you to mail my prize to me! I’m so excited for the STARZ series and the new book coming… I can’t get enough! Awesome giveaway! Here’s hoping that someone (like me) who really loves these books wins! What a very sweet giveaway. Would love to receive the necklace and book!! I can hardly wait to see the book come to life next year!!!! Hi all, OK to enter if I’m in Australia? I would treasure that copy of Outlander Companion……..and that necklace is awesome! i am on my 3rd reading of the series in 2 1/2 years, and still find something wonderful and enlightening that I missed before. Really happy I found DG!!!! This would make an awesome addition to my collection! I LOVE these books! I’ve read the series 3 times and can’t wait for #8 to finally be released!! I love all things OUTLANDER! The best books I have ever read and I am thrilled Starz is making a tv series! Thanks for sharing these fabulous items! Such lovely craftsmanship. Good luck to all. Such an awesome feeling being part of this HUGE Outlander family. Who knew the words of DG could bring so many people from all corners of the world together?! I find that awesome! Outlander series are my all time favorite books, they are the only books that I have ever re-read several times. This necklace is fabulous! Love this series! Can hardly wait for the TV series! I also put a comment up on my personal website. This is VERY cool! What a lovely prize! You are the best! Fabulous, I’ve been looking for a dragonfly necklace. They’re so pretty. Then I would need to get an Outlander inspired tattoo. I love the Outlander series. I’ve restarted it with all the excitement over the show and new book. Thanks for sharing in this giveaway! I would love a copy of the book and the necklace would be a bonus. Thank you for the chance to win. That necklace. I want it. So much. I would wear it day and night! I’m so happy I found this. I feel right at home with the other Outlander addicts! Rereading the series from the beginning again… getting ready for the March release of My Own Heart’s Blood!!!! Building excitement for the new book and the STARZ series! Don’t normally enter contests but I love this group of fans and especially love Diana and her books. Thank you for the chance to connect with like minded addicts as well as the great contest giveaways! You ladies are the BEST!! There is something about this series that Iove and I am late to the party but it doesn’t matter. 2014 is going too be an exciting year for we Outlander fans! Would love to have THE OUTLANDISH COMPANION. It has been on my wish list and I am ready to add it to my bookshelf. I love outlander, the companion would be a perfect addition to my collection. good luck everyone! see you on the other side of the stones! This is awesome!! Thanks for the giveaway!! I so love DG`s books I am on my fourth reading of them! Love the Outlander Series! Looking forward to the STARZ TV series and then new book in March! Very excited for the tv adaptation!! I can’t wait … readin through the series for a 4th time to make sure I’m ready for the new book. I am so SUPER excited for the tv series. I love the Outlander series. This is an awesome give away! What a fabulous giveaway!!! Thanks so much for the opportunity!!! This is my favorite series ever. Last year I re-read the first 6 before I read the 7th. Can’t wait for the 8th and the Starz series! It’s so wonderful to know there are so many other loyal fellow “addicts” out there! What a great giveaway, being a chance to reel in new converts. I would love to win this! Can’t wait till MOBY and the STARZ TV series! LOVE the Outlander books and am so excited for the STARZ series!!!!! I have always wanted the Outlandish Companion – fingers crossed!!! Awesome giveaway! I love Outlander! Anything Outlander has my vote! Cute, cute,cute dragonfly. Sweet Giveaway! Thanks to Outlander Kitchen for introducing me to Jamie & Claire! I love all things Claire and Jamie! Awesome give away. I would LOVE to win this. Thanks! These books are so wonderful and highly addictive! Can’t wait for the series to begin……. Such a wonderful series by a great storyteller. Love all the books and can hardly wait for the TV series to begin next spring. Wow thanks! Can’t wait for the new book and the series! Fell in love with this series while listening to the audios during work commutes. Then I bought, read and re-read the books and fell in love again. I am so excited about the Starz series coming out!!! Most wonderful stories….they just take you away. Thank you, Diana!!!! OMGosh! I love that necklace!!! Ooh, the one book I don’t have is the companion! Pick me! I love the books and can’ wait the see the series! I love this series! But I would really love to win this for my mom! Thanx for the Outlandish Givaway! U rock! What a great contest – thank you! Just found this web site and love it … cant believe how many people love this story like me, you all rock! Thanks for the opportunity to win. That necklace will go super good with my Dragonfly Tattoo!!! This is an awesome giveaway! I have been reading the series for over 20 years, it really has been a part of my life. The one thing I don’t have is the Companion, but would love to have it, as it would make my collection complete. I need a new copy of Outlander, as I have lent mine to a friend. The best series I have ever read.. I recommend it to everyone who loves a good read. I am a huge Outlander fan. I picked up The Fiery Cross in a B&N years ago not having any idea what it was or that it was (at the time) the last book in a series. Something about the book drew me to it, I read the first few pages, could not stop so I took it to the cash register and bought it. I’ve been hooked ever since. This is such a wonderful series and one of the few series of books that I’ve read more than once. Thank you! Thanks so much for these fun giveaways!!! I have really really really wanted a copy of the Outlandish Companion! The necklace is adorable too. I can’t wait to go back and look at more of the jewelry on her site! This is a lovely pairing and would love to add to my collection! Good luck to all! I’ve been enjoying this series for so many yrs. And have recommended it to many friends & my daughter who is also a fan. I look forward to the show with great anticipation. So honored to be a part of this giveaway! I LOVE Outlander and am so humbled that you all like the necklace. My business is small, but I love being able to work from home and create things that others appreciate. Am you so much to Andrea for letting me join in her giveaway and good luck to you all!!! <3 Outlander so much and am inconceivably excited re filming beginning in October. can. not. wait. am so relieved i only discovered series last year – would have definitely gone mad waiting for next book for five years and all that time for a visual reproduction! I Love everything OUTLANDER! I have read and reread series every Summer for 5 years, anticipating MOBY. I have coffee cup, bumper stickers, Tshirt, Christmas ornament, and would Love the pendant! Keep ‘em coming Diana, can’t get enough of James Alexander Malcom Mackenzie Fraser !! I love ALL things Outlander. Many thanks for a chance at the prizes! I so enjoy the Outlander series! Looking forward to the next book and the t.v. series. I don’t have Starz, but I will have to subscribe next year just for Outlander! OMG! Jamie is my all time favorite male and I just adore this series! I do not own the Companion but would love to add it to my collection! 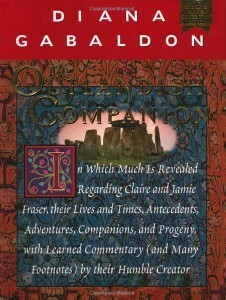 The Outlandish Companion is the only book I don’t have a copy of. Can you also give away a tall handsome man in a kilt? Very pretty necklace and would love the book!! Great give away! Love the website and what an awesome giveaway! Love the books! Can’t wait for the TV series to come out! Hope they find Claire soon! I love this series so much. Was ‘introduced’ 3 years ago by my sister while on vacation in Georgia. I just found 5 of the Hard Cover (with dust jackets intact )books on EBAY and received them earlier this week, In EXCELLENT condition as well and did not have to give an arm or leg to buy them. I really would like the Outlandish Companion and the necklace is beautiful. Dragonflies are my favorite (I live on a chain of lakes) and love the way they will quickly alight on something just for a moment. Thanks. I love this!! Perfect gift for my daughter and me!! I’ve loved this series of books since I found the first one. I just hope that the actors for the movie look something like what I’ve always imagined the characters to be. Love Outlander and all things Outlandish. Thanks for the giveaway! Absolutely THE BEST series EVER! Love the world of Outlander! Just read my first Outlander book, “The Fiery Cross”. I am now an addict! Thank you for the giveaway! Did you start with The Fiery Cross? If so, you absolutely have to go back to the beginning! I just love the necklace and the Outlander Companion! Thank you for having this contest. So excited to have joined Outlander book fans! Thanks for the great giveaway. I would be so keen to win this! However, if I don’t I will definitely be buying one of these necklaces!!! How cool! Love Outlander, and I’m sooo excited for the series! Exciting to watch this all play out with my favorite series! Hi my name is Sue and I’m an Outlander addict. Sweet combination of gifties. Love the dragonfly idea. Clever. Thank you for having this contest. I would love to win. I just hope I put in the URL correctly. How do you inter the give away? Nice giveaway! Love the necklace! This necklace is lovely and the ONLY book I don’t have is the Outlandish Companion. What a fanstastic giveaway! I have been reading and rereading the outlander series for 15yrs now. It has gotten me some wonderful times in my life and so very low points in my life. Would absolutely live to win this contest and add the companion book to my collection. Great books, great author overall great giveaway! Thanks! The necklace is great and I love the books! Cool giveaway! I am so excited about the new book in the series coming out and the fact that Stars is turning it into a series! Life is good! Love this serie, would love to win the Giveaway, I’m such a fan. Beautiful art work on the necklace! OMG Cannot wait for the new book. I have no problem relating to Jamie for sure since I’ve been married for 28 years to a 6’2″ red headed Scot..lol..and mother to a 3 adult children 2 of which are red heads as well. I love Outlander, and I can’t wait for everyone else to love it too! Outlander is my favorite book series. Diana Gabaldon is a true artist. Have been a fan of Outlander since the first book! I can’t wait for the next book to come out. I will reread the whole series before reading the new book! I am so looking forward to the series when it comes out on Starz!!! I have fallen in love with Jamie, Claire and the clan. Sometimes daydream about finding my own “Jaime” LOL!! The only thing that would make me put these books down is my grandchildren. I think Jamie and Claire would be ok with that. I am so excited for the show…except I don’t get the channel it will be shown on. I wonder if there will be a way the episodes will be available online after they’ve been broadcast. Does anyone know? Love the books, love the author, love the concept…Love!! This is awesome!!!! Thanks for the chance. I LOVE the dragonfly!! It would be awesome to win it! LOVE Outlander! Would love to have the dragonfly! Cannot wait for the TV series of my favorite books! 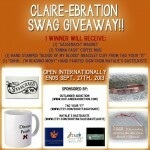 Fantastic giveaway which I would love to win! My very first tattoo I got was on my left wrist, and it reads Je Suis Prest Definitely an Outlander fan through and through!!! My mom introduced me to the Outlander series last year and I fell in love from the first read through. Stoked for the TV series! Awesome giveaway! Would love this!! love your writing, and thoroughly enjoy the outlander series. I picked up the first book at a exchange book store in Ohio, and was hooked from the first sentence! look forward to the next one!.. have read and listened to the books twice… love em! The Outlander Series is my favorite of read of all time!!!!! I would LOVE to have a copy of the Outlandish Companion and the necklace is really awesome! Thanks for the opportunity to win! Great prize, something special to treasure for those of us who love the books! All the years I’ve been reading DG, I’ve never picked up the OC. I think it’s past time, yes I do. The Best book series EVER!!!! Love it! 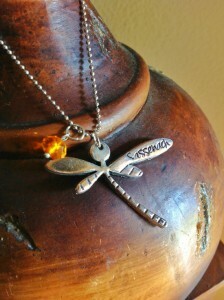 I would love to win this giveaway, I love the series and the Dragonfly is my signature. I have collected them for years! Thank you for this chance to enter the contest! I’ve been such a fan of these books, for a while now and being able to win the companion book and necklace would be amazing!! I loved the Outlander books and can’t wait for the Starz series! This is such a wonderful contests. Love , love, love that necklace! Thank you for the opportuniy! I have loved Outlander for years and I couldn’t be more thrilled to find a like-minded community! Thank you for all you do! I can’t wait to see what they do with the TV series! Whar a great giveaway! Would love to win it. I love all the books can’t wait for MOBY!!!! Can hardly wait for the TV series! It is my 60th birthday tomorrow, I canna think of a present I would like more! Thank you for the giveaway! Good luck everyone. Thanks so much for the awesome giveaway and for making it international ! LOVE OUTLANDER AND EVERYTHING CONNECTED TO IT! Hope I’m not too late to be in with a chance. Love the whole series and cannot wait for the next adventure! !